Drngsc: BN candidate Mohamad Hasan is wrong to say that his comfortable win in the Rantau by-election is attributable to people being tired of Pakatan Harapan. As Mohamad himself noted, Rantau is not an overwhelmingly Malay-majority seat. There are a significant amount of non-Malays in the constituency. Harapan lost because the non-Malays wanted to teach Harapan – mainly Bersatu and Prime Minister Dr Mahathir Mohamad – a lesson. Harapan no longer has the staunch non-Malay support that they enjoyed during the 14th general election, thanks to Mahahtir's U-turns and policy of trying to out-Malay Umno and PAS. Non-Malays view this as neglect, and a divergence from the reform agenda promised before GE14. It is so easy to lose supporters, and so difficult to win new ones, especially after six decades of consuming dedak. When will Mahathir learn this, or was this his intention all along? Mahathir's designated successor Anwar Ibrahim has to take over as soon as possible. Or else Harapan could risk losing the 15th general election. Anonymous_1547638541238.97951547637684220: I congratulate Mohamad on his win in Rantau. He won it fair and square, and voters of Rantau want him to represent them. But as for whether people are tired of Harapan, I'm not sure. Yes, people may be tired of the non-stop attacking of the previous administration. Many are annoyed that nothing much has changed for the man in the street. Enforcement remains weak or virtually non-existent. The roads in big cities are still hellish with recalcitrant motorcyclists, lorries during peak hours, motorists breaking traffic rules and beating lights. In that sense, I am pissed off with some lawmakers. But I still support Mahathir and some of his ministers, who are doing a superb job despite all the rubbish left behind by the previous government. The whole world is having economic issues. So it’s tough for the prime minister and finance minister to fix the economy. On top of that, they have to plug the gaping holes in scandal-ridden institutions like Lembaga Tabung Haji, Felda, etc. But these by-election losses are good lessons for the Harapan government. People want action, not just Najib-bashing. Beman: I am not a supporter of BN. In fact, I hope that the Harapan government will be able to govern well, for the sake of Malaysia and all Malaysians. However, from what I read in the news about the two major candidates, I thought Mohamad was a better candidate for the people of Rantau in spite of his association with the tainted former leader of his party. Harapan candidate Dr S Streram seemed detached from the people in Rantau. Worse, instead of trying to connect with voters irrespective of race, his campaign had reportedly tried to appeal to Indian voters. It looks like Rantau was never Streram's to win in GE14, even if he wasn't disqualified. Anonymous_s: When the rakyat has suffered for God knows for how long under the terrible crooks, toxic criminals, unapologetic thieves, hantu and lowlifes, then what do Umno leaders think the people should do but "blame" and curse them? Sing their praises? Why so silly? But that has always been the case, hasn't it? Anonymous_cdb4fb5d: Why is Mohamad so arrogant in his win? The acting Umno president only won a Negeri Sembilan state seat, and can't even be the menteri besar anymore. Like his boss Najib in Parliament, he has to sit on the opposition bench in the state assembly. But he's acting like he was just elected to become the prime minister! There are quarters labelling Mohamad a 'moderate'. Moderate my foot, it wasn't too long ago that Mohamad labelled non-Malay leaders "penumpang" (squatters) in this country. And some are billing him as a future prime minister? What a joke. Eleos: Mohamad won with a 4,510-vote majority, which is lower than the 4,613-vote majority he got in the 2013 election. In that sense, it isn't that great a victory. Harapan should soldier on honourably, and stay the course. Rural folk may not be ready for change after 61 years of BN rule. Negeri Sembilan Menteri Besar Aminuddin Harun should focus on real issues and not seek cheap publicity, such as by banning alcohol in private clubs. We support Mahathir's valiant efforts to bring back the rule of law in Malaysia. Long live Tun, and God bless this beloved land. Bamboo: Harapan lost both ends. It lost the support of non-Malays by stalling on reforms, and it lost the support of Malays as it could not out-Malay Umno. The best course of action would be to continue with the reforms to establish checks and balances for future governments, and improving the economy, so that every Malaysian can feel the benefits and won't have need for all the freebies. 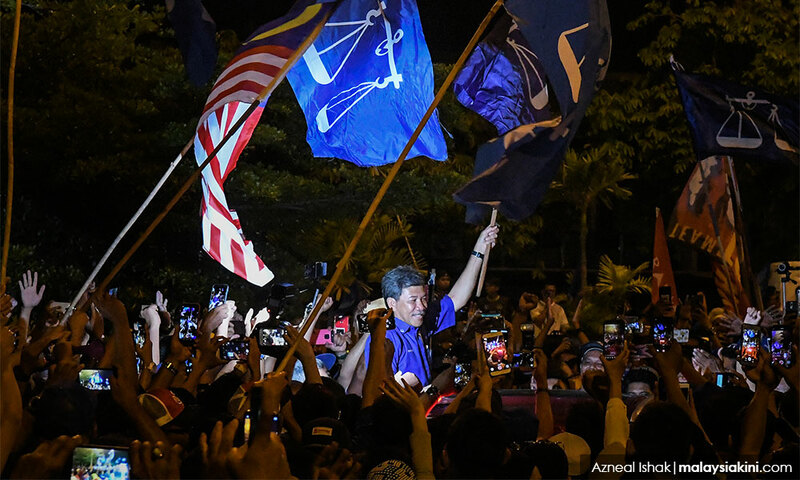 No Fear Nor Favour: Harapan, you have lost three successive by-elections to a ‘one-legged‘ party tainted with corruption scandals in less than a year of forming the new government. It’s critical that you assess your setbacks, which are plentiful. In a blink of an eye, it will be GE15. Enough of your internal political intrigue. You need to be uncompromising to rid yourself of redundant and non-performing leaders. There are no two ways about it if you want to overcome your plight. The rakyat wants change. If they do not get it, you will lose their support. Only after these reforms have been put in place will the term 'New Malaysia' mean something. Right now, it's just a slogan to deceive the people. Fernz: I said this many times before the Rantau by-election. Except for Gen Y, conservative Malays won't vote for Harapan. It is wasting its time campaigning for these votes. What did Mahathir get out of his U-turns on the International Convention on the Elimination of All Forms of Racial Discrimination, the Rome Statute of the International Criminal Court and the Unified Examination Certificate? If conservative Malays have no qualms about voting for thieves, it will be left to non-Malays to come out in full force and vote for Harapan. But if Mahathir continues to put all his efforts into wooing the Malay base, non-Malays will turn away. The only way Mahathir can force Malays to vote for Bersatu is by deregistering Umno and PAS – not implausible since both are linked to ill-gotten funds from 1MDB. Besides, Umno may have already been an unlawful entity even before GE14 for not holding its party election in time. The way the results turned out in Rantau is the result of brainwashing in a tribalistic and feudalistic society. Justice is Served: The problem with the weak and useless Harapan is that they are not doing anything about all the bigots that still thrive in Umno and PAS. They are also not throwing the corrupt individuals from these two parties behind bars fast enough. That was and will be the only formula to wreak havoc among Malay voters. And this is not even taking into account all the promises made before GE14, of which we only hear excuses now. If Harapan still doesn't get this after three straight by-election defeats, then get the hell out and let BN back in. Deo Confidimus: To be a good government is to govern for all. It has been nearly a year since Harapan seized power, and all I have read is bickering among its leaders. Harapan, time to roll up your sleeves and implement the policies that you championed before the last election. Take baby steps as you are new at this. Take the good things that BN has done, implement good policies and move forward. The rest will come in time. Mat MD: Politicians have put Malaysia in a state of perpetual anxiety, with fearmongers lurking in every nook and corner, spreading doomsday news and causing widespread confusion. Malays fear that their rights will be taken away and that they will be left in a lurch. Chinese fear that if Malays hold sway the country will be turned into a conservative Islamic state. Indians are left to gaze at the stars, and wonder which party they have to pin their hopes and aspirations on. Only if politicians find the holy grail and use it to remove this anxiety that has bedeviled the populace can Malaysia move forward to progress with full confidence in peace and harmony.